I farm with Renee and my parents in South West Victoria – the climate is temperate with high rainfall, receiving an average of 850mm annually. 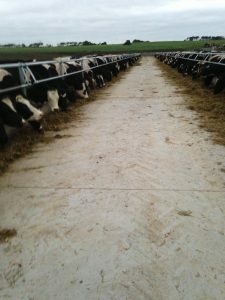 Our biggest concern was feed wastage so we opted for a concrete feedpad to get more into our cows, improve production and to allow us to handle wet conditions more effectively. May 2015 – Cows took to feedpad straight away, feed wastage dramatically reduced from day 1. 1. Focus on growing pasture and fodder and reducing wastage – really worth the effort. 2. Analyse if changes to feeding will increase your exposure to risk –no surprises is best. 3. Remember to think about upgrading your effluent system. We love the challenge of producing more milk and having better animals day after day through fully fed cows. In 2014 we merged two generations’ neighbouring farms (ours with my parents) and built a central dairy. Lifestyle and balance is important – we have a young family, and my parents would like to gradually step back and ease into a retirement stage. A primary motivator was to reduce feed wastage. We spend about $300,000 per year on bought in feed (silage; vetch hay). If we can minimise feed wastage by 10-30% this should realise $30,000-$90,000 in savings annually. We also wanted the ability to increase stocking rates, and manage pasture productivity and utilisation more efficiently. We wanted to shift to summer calving, primarliy for the more appealing labour conditions during calving, such as longer day light, warmer nights and less mud. We put in a 500 cow concrete, central alley feedpad which cows access after each milking. An underpass under the dairy laneway is also planned to ease cow traffic flow on and off the pad. A lot of thought and consideration went into the feedpad site. It is close to the dairy, utilises an existing slope to minimise earthworks, and incorporates into the dairy effluent system – two ponds which we upsized to total 17 mega litres. Initially we spoke to local farmers with different feedpads and then consulted the Feedpad website. The whole process took about 11 months from concept design and planning through to construction completion. A few hold ups with construction were encountered, such as the Christmas period and labour shortage due to an unforeseencircumstance. We moved the calving pattern from July to January over 18 months – 2015 was end of the long lactation and first summer calving group. I would have liked to put in a twin feedpad next door at the same time to minimise disruption, and roof the feedpad to provide protection from the heat. Lack of capital was a barrier this time, but this will allow us to take a measured approach to tweaking the ideal system for us. Eventually we might look at conversion to free stall housing for even more flexibility. Our feedpad has certainly cut feed wastage while providing the flexibility to better manage pasture pugging and grazing pressure, particularly during very wet weather conditions. The feedpad will only be used when grass is limiting, ie not so much in Spring. We’re estimating at least a 10% reduction in wastage throughout the year, and higher in winter. The investment will be paid back in five years, all things going well but we will need to purchase a new mixer wagon and larger tractor to pull it. We’re aiming to eventually milk 800 cows from the same land, and increase cow production from 630kg MS to 650kg MS per cow next season. There is now more effluent to manage as the feedpad is flood washed after each use. This can be either recycled or redirect back to paddocks.